Lopez is a defensive presence the Knicks didn't have last year. It's far-fetched to call Robin Lopez the best defensive anchor the Knicks have had in the long time. That would be a disservice to the tremendous work former Defensive Player of the Year Tyson Chandler did during his time in New York. But Lopez is darn good fundamentally, and certainly adds an element last year's 17-win Knicks didn't possess. As a member of the Trail Blazers last season, Lopez helped his team to a top-10 ranking in points allowed per possession. He does swat the occasional shot, but he's known better for his footwork and defense against the pick-and-roll. That's an element New York missed mightily last year. The Knicks' bigs either weren't particularly mobile and/or weren't very effective communicators. 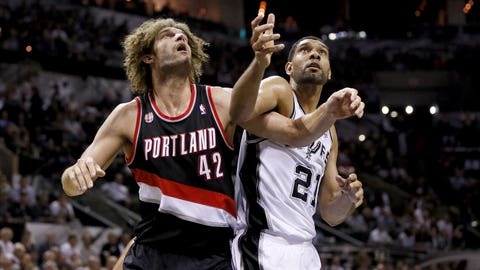 Lopez is able to defend in space, an essential trait for an anchor, and talks. Non-stop. That, plus holding himself to a higher standard than your average defensive center should make a major difference for the defense that ranked 28th in points allowed per possession a year ago. The Knicks gave Lopez $54 million over four years to be their defensive anchor. It's something he takes very seriously, as he's shown in the first two days of training camp. “Basically all tables, stanchions and what appear to be immovable objects should get out of the way when he gets [ticked] off,” coach Derek Fisher said after Wednesday's practice. “If a guy scores on him or something doesn't go well, he tends to make sure that everybody knows that he's not happy.